I guess I am on a roll to see every “Grand Canyon” there is! The Skywalk over the West Rim. You can see the strata in the Grand Canyon. I finally saw the true Grand Canyon two years ago. And I loved it. We went to the West Rim and were able to walk at above the Grand Canyon on the Skywalk, and also visited Eagle Point. These are located on the grounds of the Hualapai Tribe’s Reseravation, and are not part of the Grand Canyon National Park. But it is a wonderful experience. The Grand Canyon is 277 miles long and as much as 18 miles wide. The deepest part is 6,093 feet. It is a very big canyon. The Yellowstone River flows in the Grand Canyon of Yellowstone. A tree hit by lightning in Yellowstone and the strata. 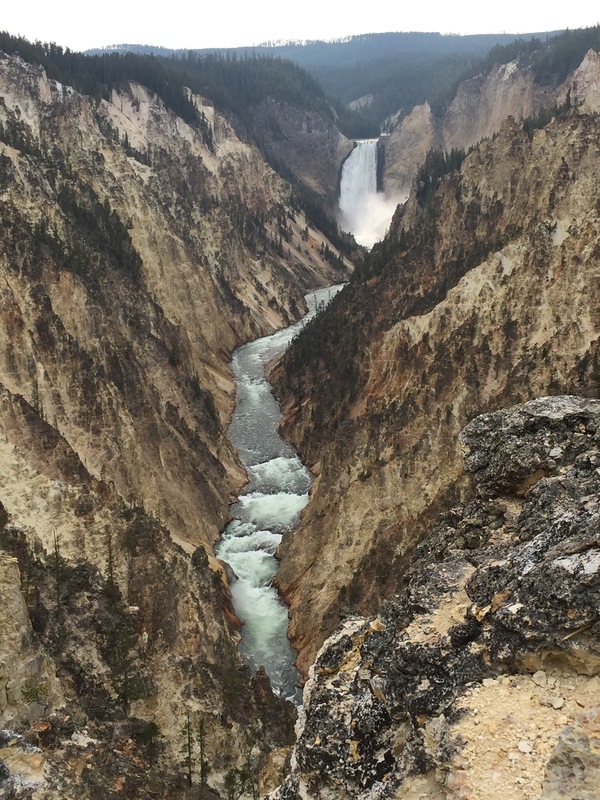 Last August I was in Yellowstone National Park, and visited the Yellowstone Canyon, where the Yellowstone River flows in to a valley forming a canyon. This is called the Grand Canyon of the Yellowstone. A beautiful site, we were able to view the magnificent waterfall that helps create the canyon. This canyon is 24 miles long, as much as ¾ of a mile wide and up to 1200 feet deep. Yellowstone Canyon is in Yellowstone National Park. It is where I finally got my senior park entrance card! So, of course, when I knew we were going to go to Kauai, I knew we had to go to Waimea Canyon to see the Grand Canyon of the Pacific. This canyon is 14 miles long, one mile wide and up to 3600 feet deep. It is part of the Waimea Canyon State Park. From the Waimea Canyon Lookout, you can see, off in the distance, some of the waterfalls that feed the river below and form the canyon. But it is much easier to seem them with binoculars. The biggest difference between this canyon and the other canyons, is that these mountains and canyon is all volcanic material. So there is really no strata of stone like you see on the rocky canyons, like the Grand Canyon. But it does not matter, all three of these canyons are magnificent in their own ways. I am so glad that I have had the experience to see them all. I will let the pictures explain. 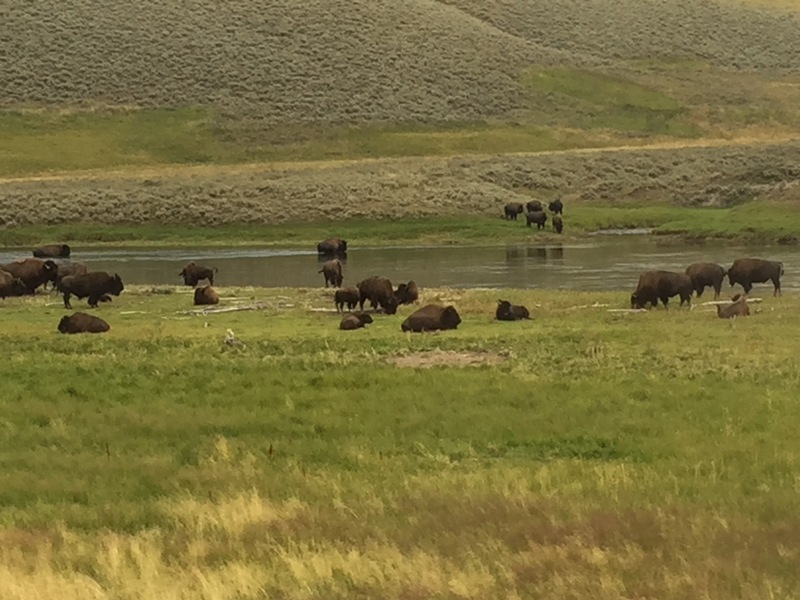 Are there even words to describe Yellowstone National Park? I am not sure. The words I know seem simplistic and inadequate. The sights to be seen at this gigantic nature preserve are unique. The vistas are beyond breathtaking. 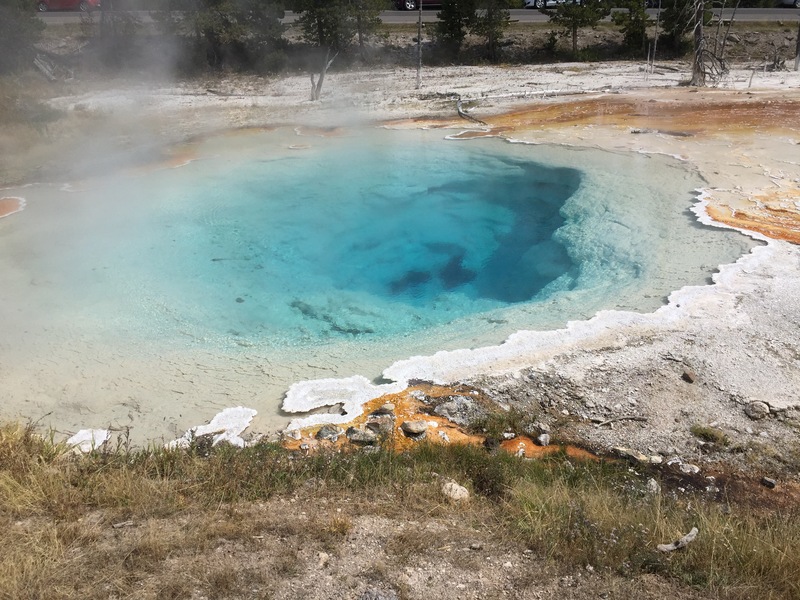 The geysers, hot springs, mineral deposits, steam vents, boiling mud and crystal blue ponds so close together astounds the mind. The waterfalls throughout the park are majestic. The hot water waterfall sprewing mineral rich waters seems unreal. While the lower falls coming from the Yellowstone River at the edge of the multicolored Grand Csnyon is stunning as the water’s spray glistens in the sunlight. 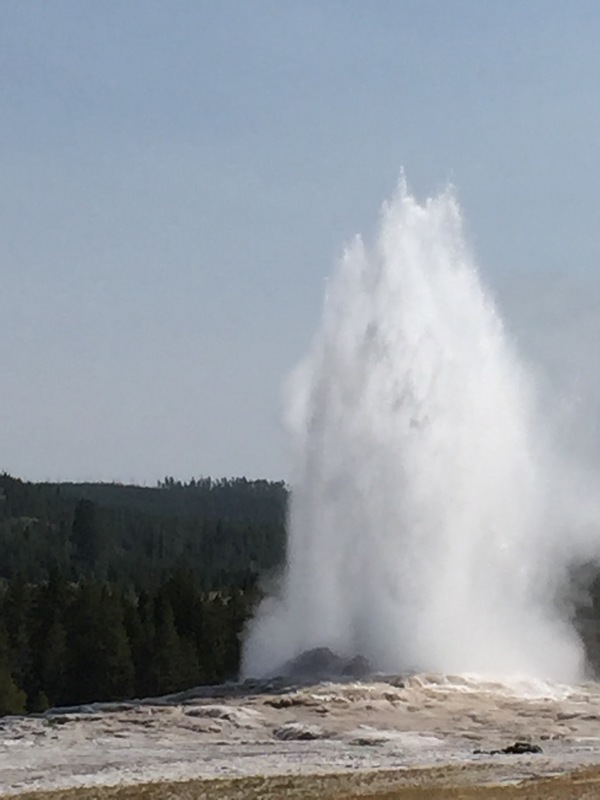 As we waited for Old Faithful geyser to erupt, with thousands of others, we could feel the excitement build as tiny jets of swater realeased in the air. I could hear the rumble of the ground. A few minutes before the main eruption began I felt a slight tremble in the ground beneath me. Then behold a stream of atomized water flew in a tower above us! We saw four other geysers erupt during our day at the park. Then there are the wildlife: bear (we saw the flash of one along the side of a road); bison (we saw three groups totaling over 100 bison, as well as many single bison relaxing in the park); elk (one hiding in the trees); deer (another watching us from the woods); pronghorn deer and a beaver happily swimming. Yellowstone River and falls in the Grand Canyon. I think my favorite was the Lower waterfall on the Yellowstone River that leads into the Grand Canyon. What an impressive site! The colors of the canyons walls are so unusual. Now that I know the park is situated above a giant magma field and that a large section of the park is a gigantic caldera, I am even more intrigued by this treasure. I can see why the first explorers were so insistent that it become a National Park. The first one so proclaimed. The lodges and the hotels are also memorable. 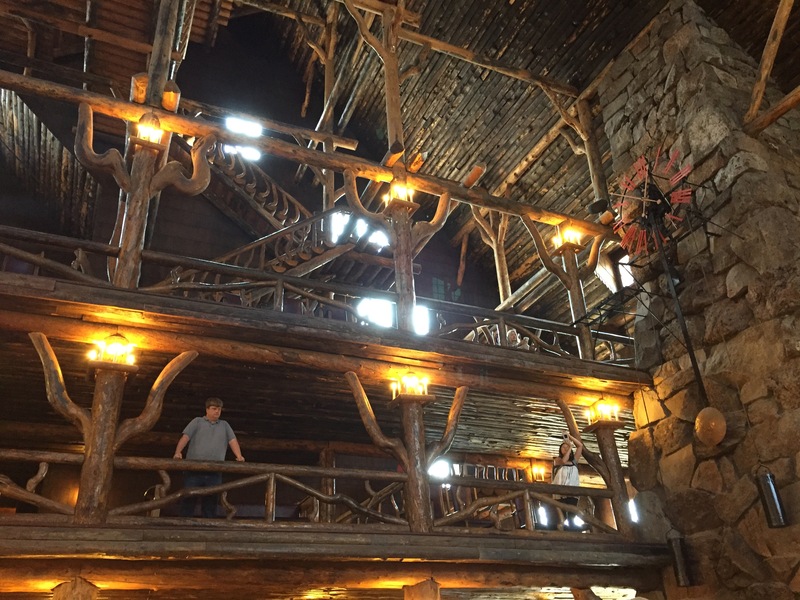 Old Faithful Lodge with it’s wooden logs and 76 foot ceilings. The Lake Lodge in its bright yellow, recalling the opulent travel of the wealthy in the 19th century. We have so much more to see, but not enough time. We have to come back!!! Luckily we are now officially seniors and we were able to purchase a lifetime pass for the parks for only $10. They soon rise steeply in price. Getting them in Wyoming was an added bonus. When I return I plan to spend two nights in the park. There is so much we did not get to see. This taste of Yellowstone has me Yearning for more! To be honest, seeing Yellowstone ALMOST eclipsed the Eclipse!